Access Control is only as reliable as its cables. While this aspect lacks the sexiness of other components, it remains a vital part of every system. In this note, we look at the types of cables used by these systems, including 22/4, 18/6, 22/2, and where special attention should be spent when installing them. Even wireless systems generally use some cabling, as the components on the door (eg: readers or door position switches) often are hardwired even if the controller is not. 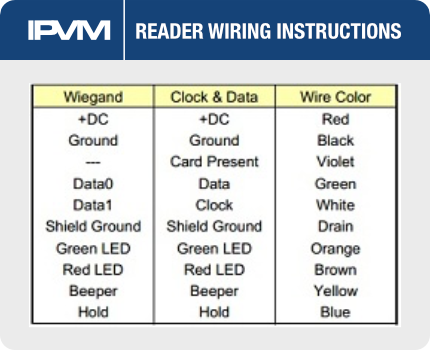 Schematically reader wire color generally indicates the function of individual wires. For example, power is often red & black, data is typically green & white, and other features like beep, tamper, or LED color are reserved for other strands. 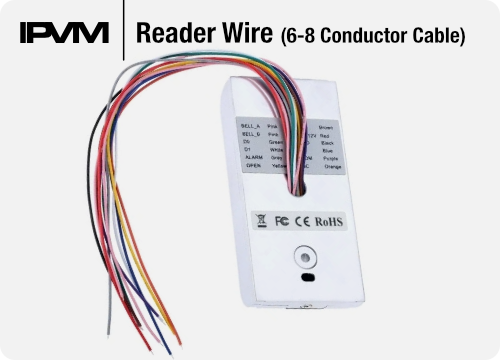 This cable is commonly used between the main control panel and door controller, and may cover long distances as a result. Door devices like PIR 'Request to Exit' devices or door operator controls are wired using this type. This cable is typically used to deliver power to devices, like maglocks, strikes, or other accessory devices like illuminated RTE Push Buttons. It may also be used to wire contact sensors, door position sensors, and to cameras for I/O linked functions. Many door control devices are equipped with 'drain' wires that are included for use when a door exists in a 'noisy' RF/EMI environment. 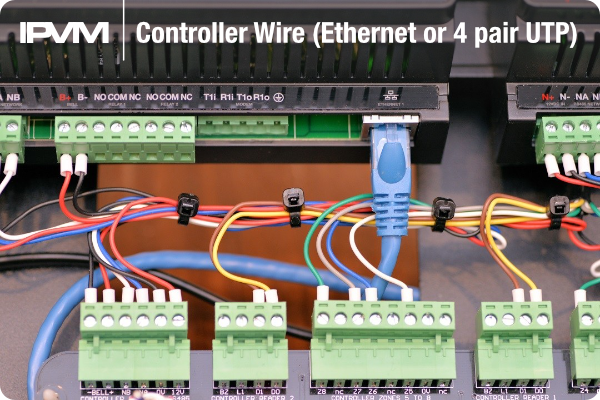 The extra wire acts as a grounded sink for ambient interference around the bundle, and helps maintain transmission between reader/controller or controller/panel. 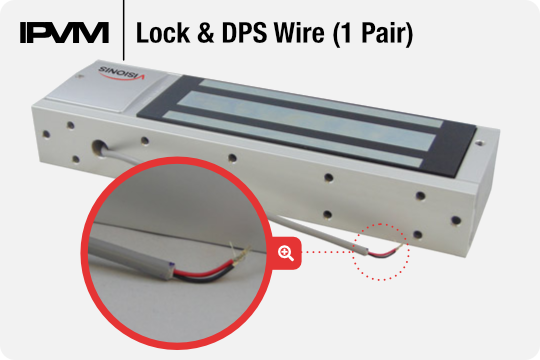 For more, read our Drain Wire For Access Control Reader Tutorial. Wire gauge, or thickness, is a key aspect determined by cable run distance, voltage and amperage draw. The manufacturer specifies the wire's specific gauge. 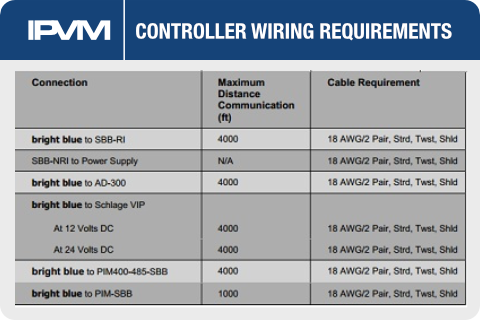 The most common gauges chosen in access control are 24, 22, 18, and 16 AWG sizes. In general, greater voltages and longer distances call for larger diameter wire (lower AWG number). Each component may specify different wiring, and the cable specification may change according to total distance / type of voltage used. The specific configuration of cables depends on the mix of devices used at the door. However, the number of cables normally will not exceed 4 or 5 types, and in some cases multiple devices like contrats and RTE devices can be connected on the same pair. These combinations may be delivered as a factory bundle or combined by the installer locally. 1,000 feet of Factory Bundled Cable @ ~$1,250 or about $1.25 per foot. Total: ~$525, or about $1.05 per foot. Using individual pricing yields a savings ~$0.20 per foot. While straight pricing typically favors unbundled product, factory bundles reduce labor cost. A rough rule of thumb is 2 or 3 hours preparation time per 500 feet for bundling cables oneself, which saves a few hundred dollars to DIY. 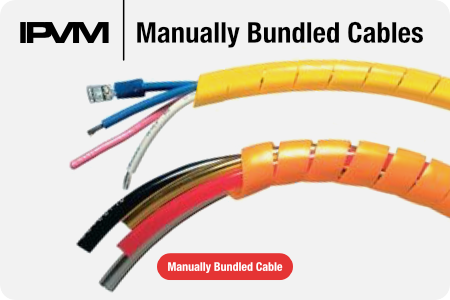 While more costly per unit length, factory bundled cables take no time to assemble together. Aside from improving install speed, having a single bundle of wires make hiding and protecting the cable easier than separate strands. However, multiple variations of bundles are available, and proper specification is essential. Furthermore, not every door uses the same 'mix' of devices, and the bundle may change between openings. 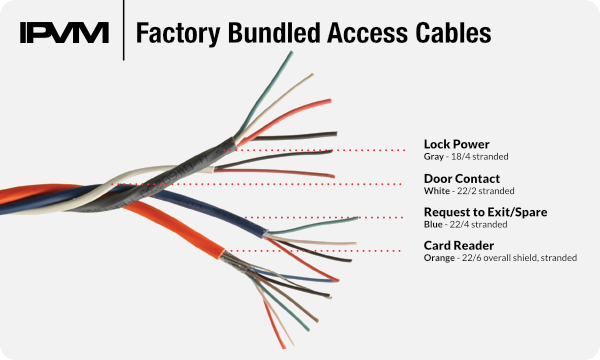 Additional, depending on the installed location of door components, individual cables may need to be run separately from a bundle regardless. Running cables to door and access components is frequently more difficult than standard ethernet networks. Not only are the overall number of cables greater, the locations they run to are often farther away and in difficult to access locations. Also, the construction of doors and frames vary greatly, and running cables 10 feet at the door can be more time consuming than running hundreds of feet in cable trays or raceways. To conceal and protect door cabling, it must often be run through door and even window frames. Take the example of a common glass 'store front' type opening, composed of swinging thin framed glass doors and 'lites'. 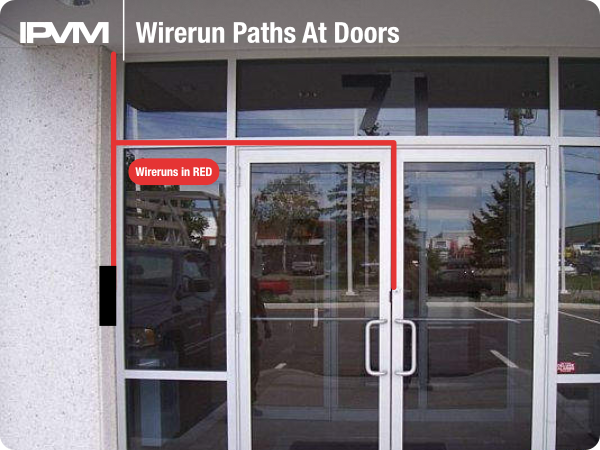 Rather than taking the shortest route from controller to components, a longer path crossing multiple panes and frames must be taken, extending overall cable lengths and installation times. Access control cabling can encounter atypical constraints. For example, access cabling is frequently run in direct contact with metal frames, and some AHJs may require more stringent insulation specifications (e.g., rigid tubing/ conduit or thicker jacket) than standard types. Another common issue is required penetration of firewalls to connect devices. In many cases, cabling is run to avoid drilling or cuts through a rated wall, but this is unavoidable with access control installation. Drilling through a wall may require a fire-rated connector and the use of a fire-rated sealant to back-fill any holes. 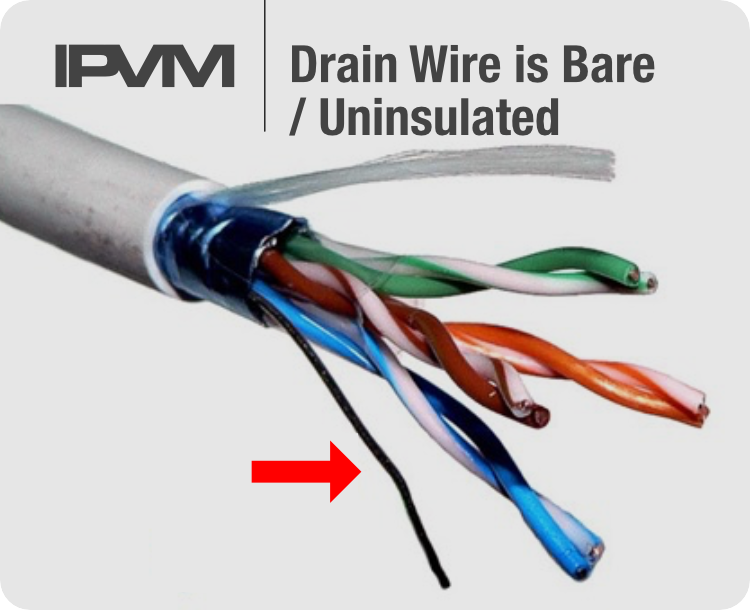 Prior AHJ approval to make a penetration may be required with subsequent inspection of the final cable run. Since requirements vary by jurisdiction, checking with the AHJ is a prudent first step.